Hey, party people! Whatchya been up to for, say, the last 10 weeks? I know, I know.. it’s been a while since I posted a recipe, but this one’ll all but make up for it. 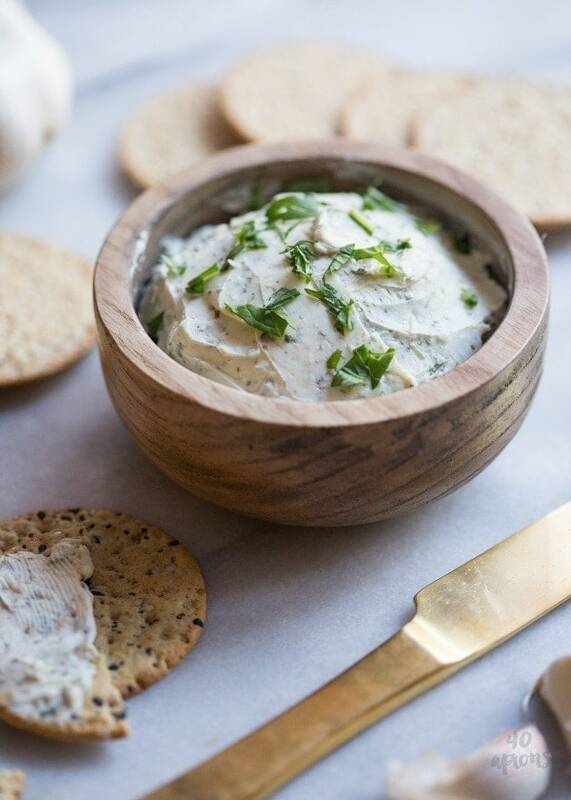 Homemade Boursin–5 ingredients, super delicious, so easy. And you might have everything already in your kitchen! So basically this is the perfect holiday recipe for last-minute drop-in guests, and will help you make Ina Garten look like a total slob (just kidding, Ina! You are my queen.). I first had the inkling to make Boursin at home when I passed over a recipe on our local newspaper’s blog. I was a little surprised and a lot amazed that it was so simple and was made from–yes–butter and cream cheese. I mean.. what? Butter cheese? Cream cheese cheese? Anyway, one of the ingredients was a dried fines herbes blend, so I hopped on over to a spice shop and picked up a bottle right away. And three years later I put it to use! Seriously, I can’t even blame this one on the baby. That little jar on fines herbes just sat patiently waiting in the pantry for something like three years until I decided on a whim–at Target, loading up my basket with all things peppermint [yes, I am so white] whilst on a run for “just one thing”.. isn’t that always how it goes?–and I called O to ask him to take a cream cheese out of the fridge. His response? Seriously, honey?! “Why?”!? I mean.. just.. no. 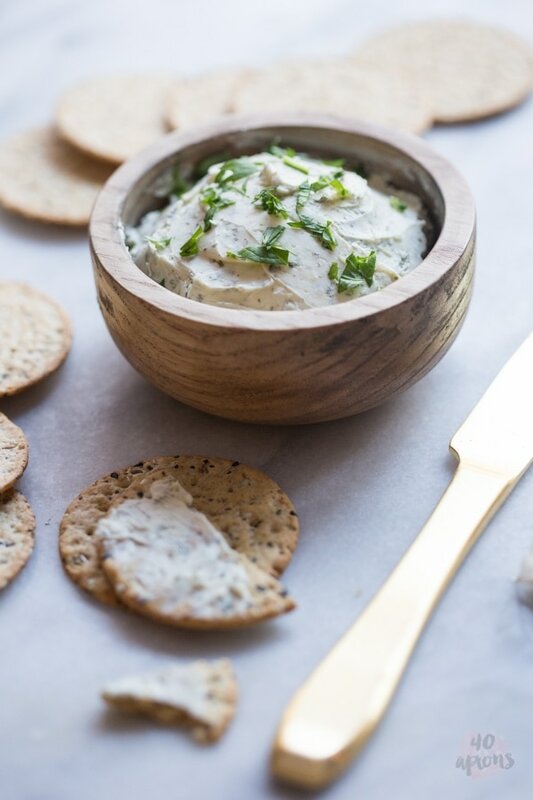 Anyway, flash-forward a few days, and I was cooking furiously while the baby cried that “I’m hungry, drop everything you’re doing and come feed me, mama!” cry, and I put up the Boursin and water crackers I was snacking on (nursing = ravenous all. the. time.) and O literally got mad at me, because I “knew he would want some” and I was apparently viciously holding out on him by returning the Boursin to the fridge. It’s an interesting marriage we have, for sure. So, the stuff is good. Damn good. Like, get-mad-at-your-wife-for-keeping-it-from-you-a-second-longer good. Did I mention it’s good? And it’s crazy easy. Like press-process-on-your-Cuisinart easy. 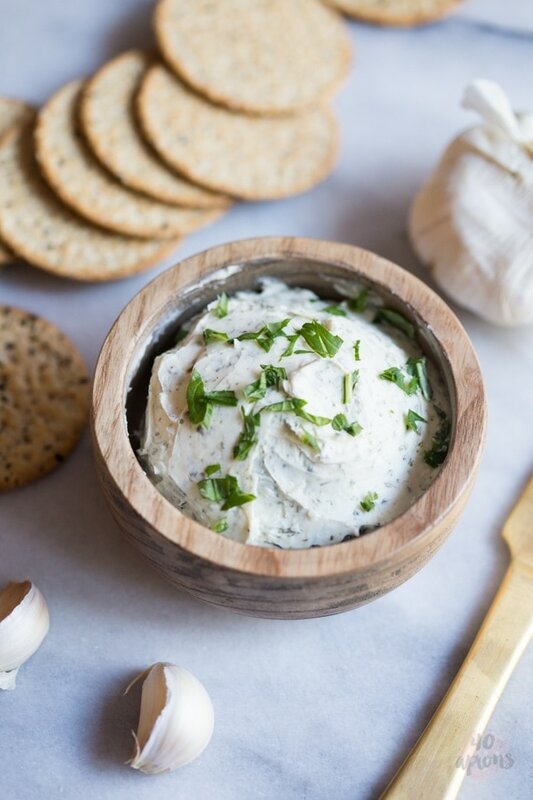 And it calls for five things: cream cheese, butter, fines herbes, parmesan, and garlic.. which you might very well have in your kitchen as we speak! 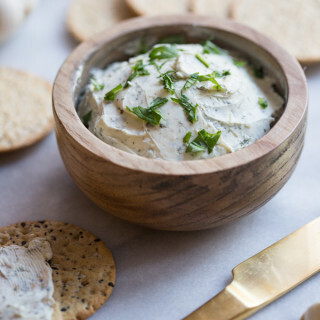 If you don’t have fines herbes, I seriously suggest you get a jar, because the blend can kick up any thrown-together dish that has any sort of French inkling at all. Aside from just eating it on crackers or, you know, straight off the butter knife, I often stir it into pan sauces for a rich, easy elegant upgrade. 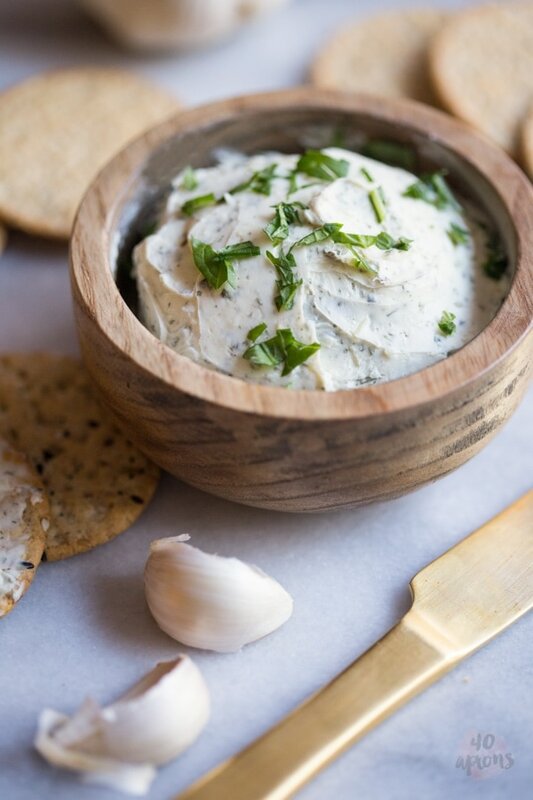 I mean, think about it–butter, cream cheese, garlic, parmesan, and herbs. The perfect base, right? So, only three years later, we keep a batch in the fridge at all times. Make this! Five ingredients, totally delicious, and so easy to throw together. 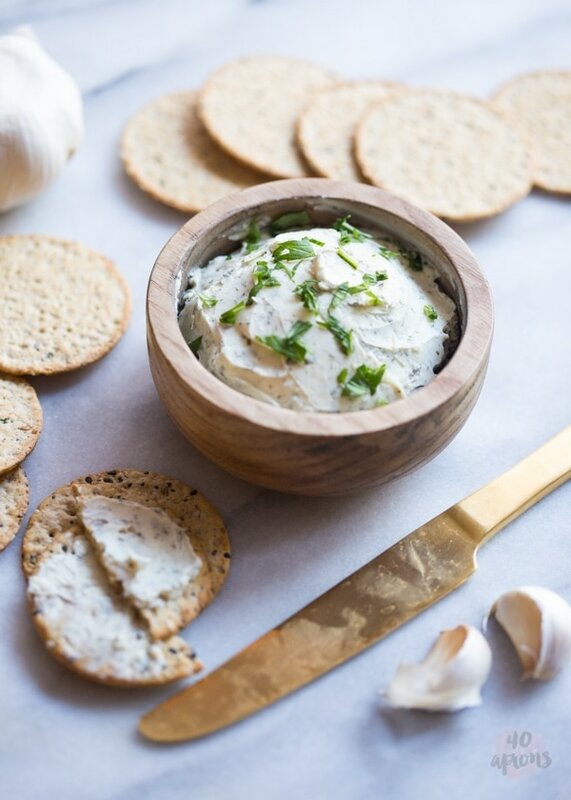 Perfect for last-minute entertaining, snacking, and recipe bases. Blitz garlic in the food processor until minced. 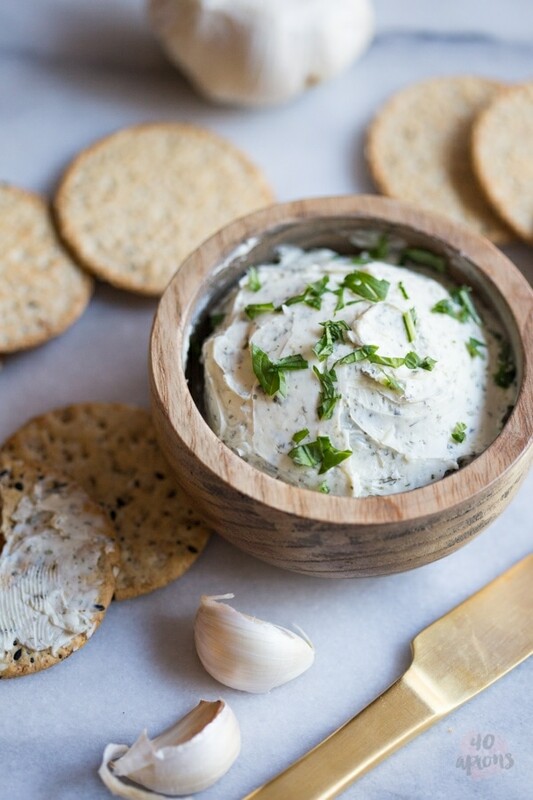 Add remaining ingredients--start with just 2 teaspoons of fines herbes and rub between your fingers before adding. Blitz until smooth. Taste and adjust seasonings. I like a bit more fines herbes than just 2 teaspoons, but all blends will be different. Keep refrigerated in an airtight container.